A nice Halloween and winter-inspired dish for adults using seasonal vegetables to create a healthy and quick midweek meal. 1. Preheat the oven to 180°C/gas mark 3. 2. Place 2 tablespoons of the olive oil and the mustard in a small bowl and mix to combine. 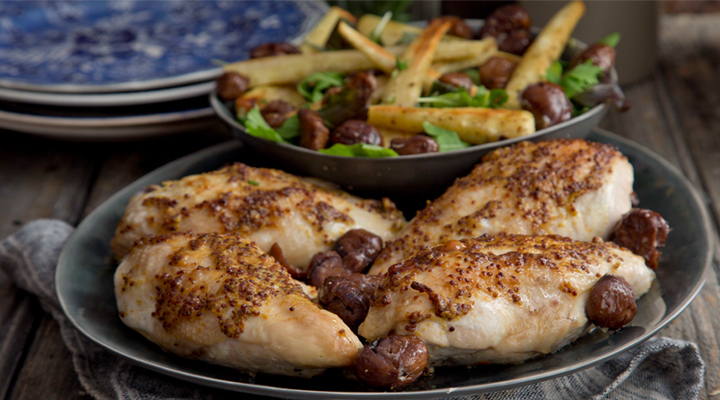 Place the chicken breasts in a roasting dish and cover with the mustard mixture and a good pinch of salt and pepper. Place in the oven and cook for 20 to 25 minutes, until the chicken is cooked through. 3. Place the parsnips on a baking tray and drizzle with the remaining tablespoon of oil and season with some salt and pepper. Place in the oven and roast for 20 minutes. Remove from the oven and stir through the chestnuts and rosemary, then drizzle over the honey and place back in the oven for 10 to 15 minutes. Allow to cool slightly. 4. Toss the spinach leaves with some seasoning, then turn out onto a serving platter and add the cooled parsnips and chestnuts. Serve together with the chicken breasts. Tip: Don’t add the warm parsnips and chestnuts to the spinach too soon, as it will wilt and become soggy.